Set on learning to play guitar, but don’t know how to read sheet music? Guitar tabs are a simple, beginner-friendly alternative that will allow you to progress more quickly. Follow our guide and you’ll be strumming your favourite tunes in no time! Before we begin talking about reading tabs, it’s important to be familiar with the different parts of your guitar. 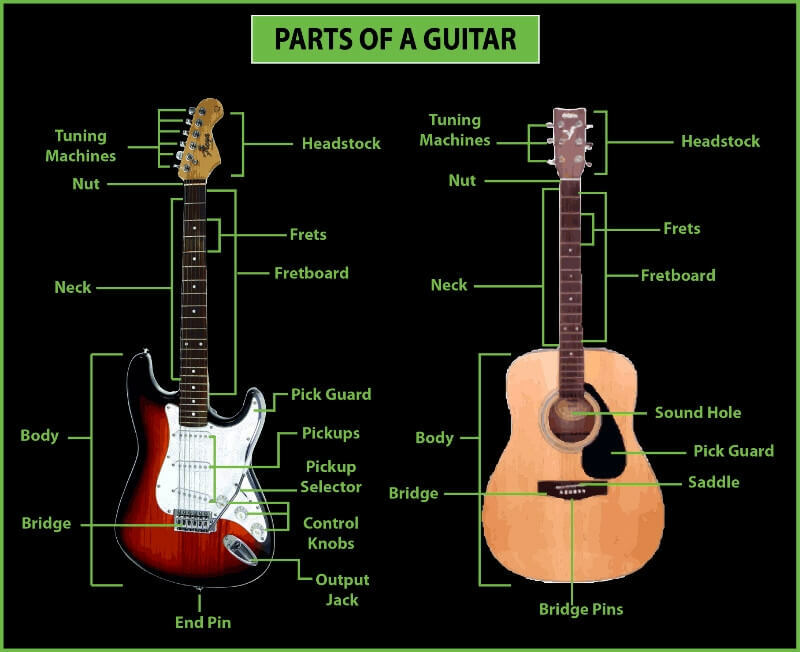 Whether you’re learning on electric or acoustic, every guitar is made up of the same three basic parts: the body (the larger, hollowed out part), neck (the long “stick” extending from the body), and head or headstock (located at the far end of the neck). The image above provides detailed guitar “anatomy”, but all you really need to know to read guitar tabs is the location of the head, neck, fret board, and frets. As you can see from the diagram below, frets are numbered beginning at the head, from 0 – 22. Guitarists play different notes by moving horizontally either up (towards the body) and down (towards the head) the fret board, or across the neck vertically. Now that you have the terminology, you’re ready to start playing! In order from the top (thickest to thinnest), the strings of your guitar are E, A, D, G, B, e. You’ll notice the top and bottom strings play the same note, so we use a lowercase “e” to represent the bottom string. When you strum your guitar without placing pressure on any of the strings on the fret board (and your guitar is tuned), what you hear is the combined sound of the “open” notes of each string. We call this “open fret”. The top string (also the thickest) is called the E-string, because it plays an E note open fret. The same rule applies to the all the strings—picking an open fret A-string plays an A note, open fret D-string plays a D note, and so on. Pick the G-string with your index finger placing pressure on the string at the second fret. Pick the B-string with your ring finger on the third fret. Pick the e-string with your middle finger on the second fret. Pick the G-string with your index finger on the second fret. The above example asks you to play each note individually, but if you were to play them all at once you would be playing a D major chord. In the example above, the tab is instructing you to place your ring finger on the B-string at the third fret, with your middle finger on the e-string at the second fret, and your index finger on the G-string at the second fret. Notice the “x” symbol on the E and A-strings—this means those strings aren’t played. 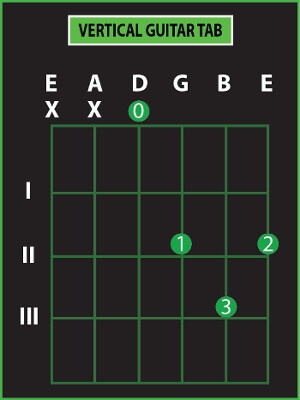 Notice that in this case, the e-string is located on the far right side, while the E-string is located on the far left. It’s the same chord depicted in the earlier example, except that it’s been rotated 90 degrees. 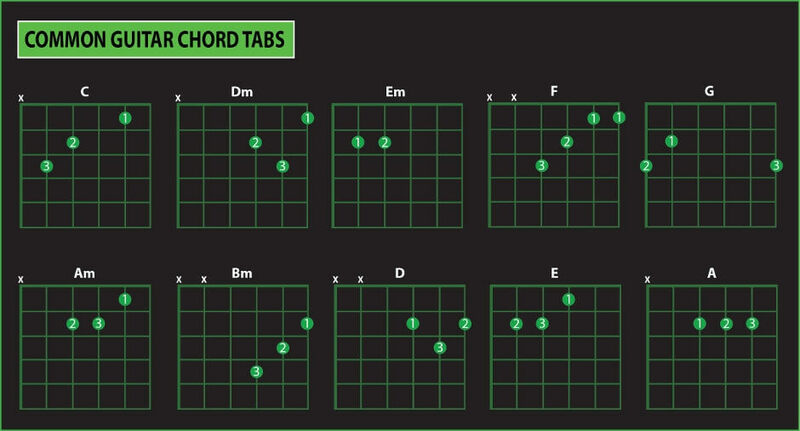 Now that you know how to read basic tabs, try playing some of these common chords. You’ll see the strings aren’t labeled— this is often the case with guitar tabs. Just remember the e-string is always the first on the right. You’ve grasped the basics, and want to take your playing up a notch by using more complex techniques. When you place your finger on a string and pick, then move your finger up or down the neck to a different fret without picking a second time, this is called a hammer-on. The diagram above is telling you to pick while your finger is on the D-string at the 9th fret, and then move your finger to the 11th fret. Pull-offs are similar to hammer-ons, except that a second finger is already in position at the next fret, creating an instantaneous change in note when the first finger is removed. The diagram above asks us to pick with a finger on the D-string at the 11th fret, and a second finger on the D-string at the 9th fret, and then “pull off” the finger that was on the 11th fret, leaving the other finger in position. Sliding is exactly what it sounds like: picking the string with a finger on one fret, and then sliding it up or down the fret board without taking your finger off. The example above is telling us to pick the D-string with a finger on the 11th fret, and then slide to the 12th fret without removing the pressure of that finger. Try to find tabs that include the chord name (e.g. “E” or “G minor”). That way, when you’re jamming with friends and someone suggests you change the chord progression from GDG to DGD, you’ll know what they mean. While it may be tempting to try and learn your favourite tunes first, it’s best to start with what’s easy. Look for songs with simple, repetitive chord progressions, and save the string bending for when you’re comfortable with the basics. If you come across tabs with notes other than the usual e-B-G-D-A-E notation, it’s because the song is not played using standard tuning. In order to use them, you will have to re-tune each of your strings to match the notes indicated on the tabs. Where can I find Tabs for Popular Songs? Really helpful read to anyone that wants to learn the guitar. Well written and easy to read and follow along!